I confess. I've done it. I think we've all done it. We innocently set out to the feed store one warm spring morning intending to just grab a bag of feed and maybe the latest chicken magazine, and instead we pull open the door to a cacophony of baby chicks peeping and are unable to resist. And just like that, we've got babies again! Unplanned babies. 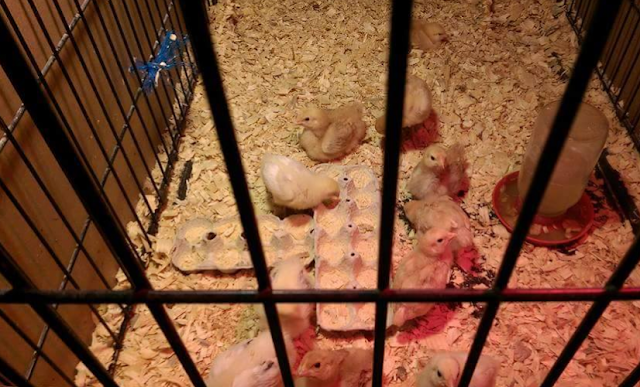 And hopefully you've thought to grab a bag of chick feed off the shelf while you were at the feed store, at least...and maybe a heat lamp bulb. But your babies will also need a place to live. A place where they'll be warm and safe and have room to grow. So what to do? 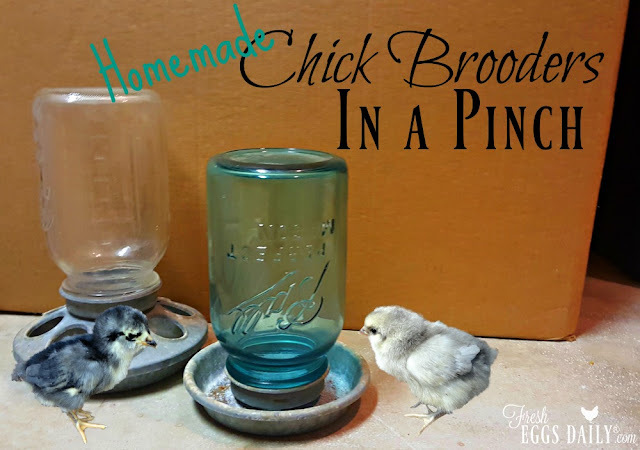 Well, luckily there are lots of things you likely have around the house that can double as a chick brooder. 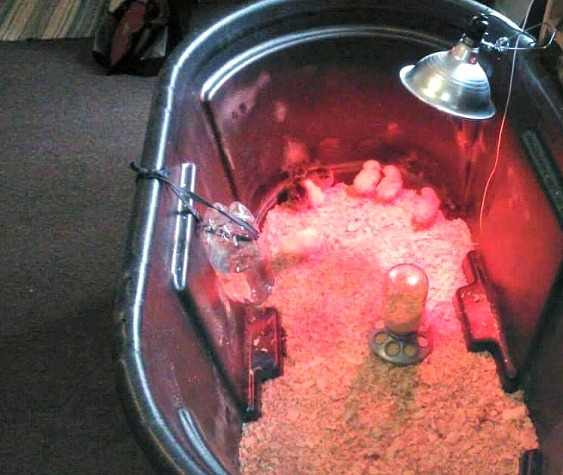 Hang a heat lamp over the brooder (far enough so it's not a fire hazard) or use a Brinsea EcoGlow, put some shavings in the bottom, add a little chick feeder and a waterer and you're ready to go. Here are some things that I've used as brooders for my chicks over the years, as well as a few other clever ideas. Thanks to Lauren C. from 'Til the Rooster Crows Ranch for helping out with a few of the photos. 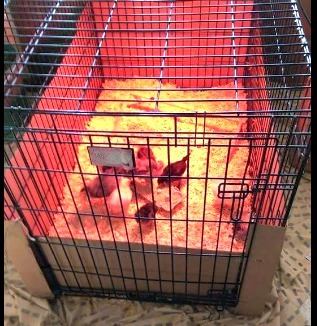 A large cardboard box is probably the quickest and easiest way to get a brooder set up. As your chicks grow, move them into bigger and bigger boxes, or even try taping two boxes together to give them more room. Since the boxes will likely be fairly tall, you don't necessarily have to cover the top as long as you don't have kids or pets who might get curious about the little chicks. Cardboard is pretty flammable, and will get wet, so it's not my top choice for a homemade chick brooder. 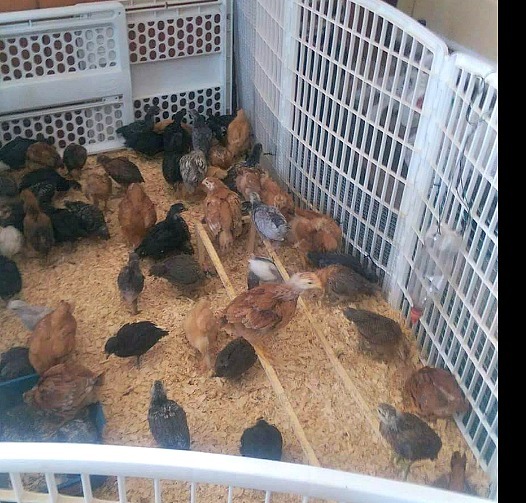 A metal wash tub will double as a brooder in a pinch. It won't hold too many for long, but while they're small, I like using a wash tub because it's easy to carry outside to clean or to move your chicks to a different area of the house. It won't catch on fire like a cardboard box might, and it can handle water spills. Cutting a piece of screen or welded wire fencing to fit over the top is added insurance you won't have an escapees. A large plastic tote makes a great brooder and offers a little more room than a wash tub. It's more impervious to spills and moisture than a cardboard box and a window can easily be cut in the lid to provide air and also keep the chicks from hopping out. 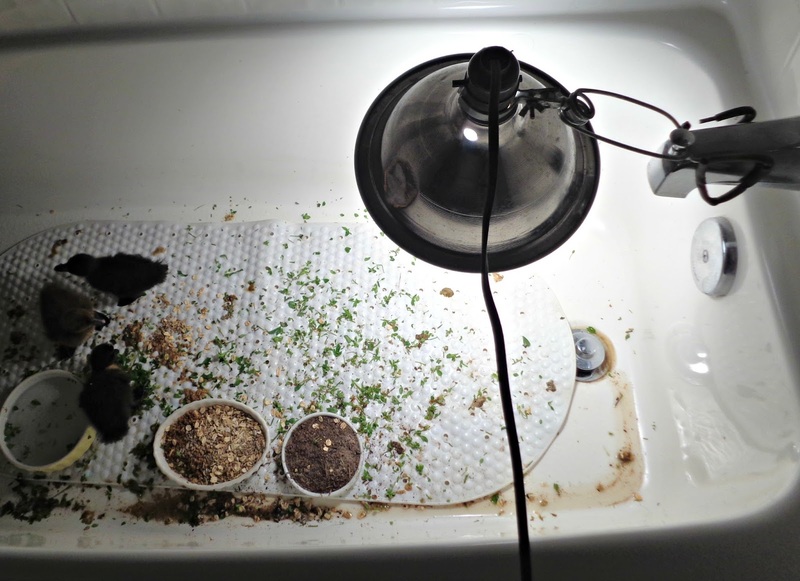 Read HERE for a step-by-step tutorial to turn a plastic tote into a brooder. 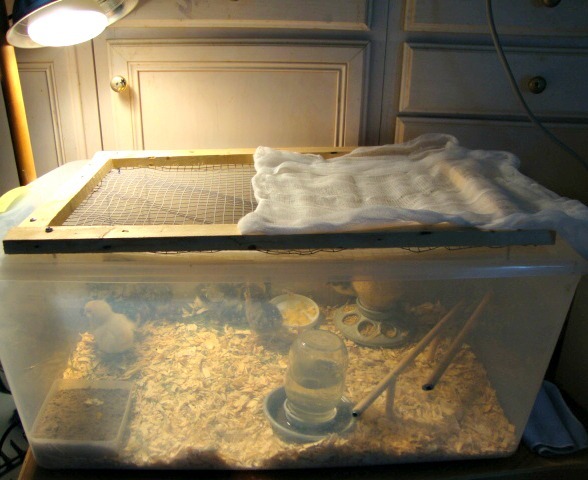 Any small animal cage will work wonderfully as a chick brooder, but you'll want to use some cardboard (or plastic) along the bottom few inches at least to be sure your chicks don't squeeze through the openings and also to keep drafts out. 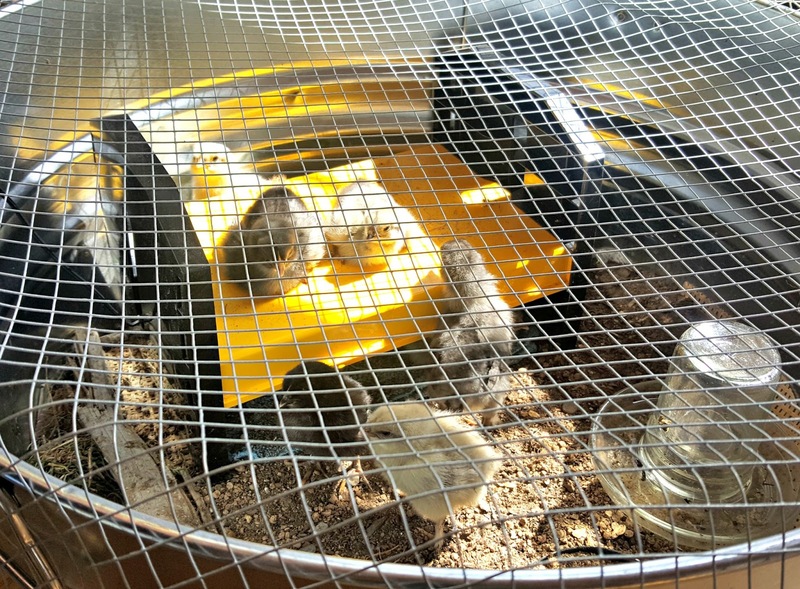 If you have a dog crate you're not using or an old bird or bunny cage, you've got a perfect chick brooder. In a pinch, setting up some puppy/baby gates in the garage with a tarp underneath can at least keep your new chicks corralled for the time being. 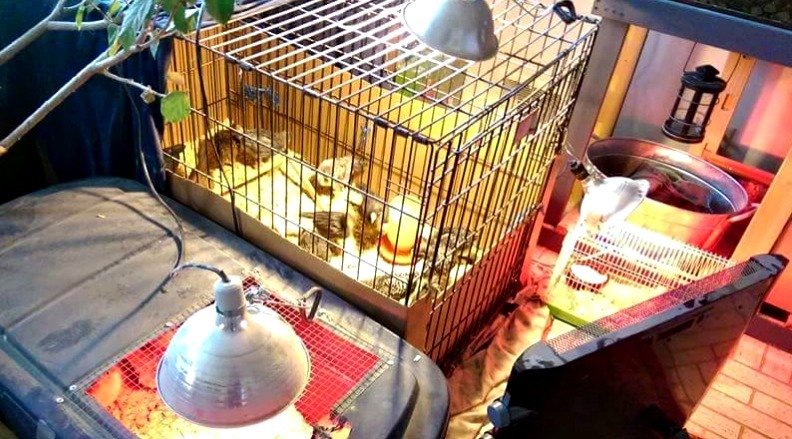 You might need to wrap some plastic around the bottom few inches so your chicks can't slip through the holes in the gates, just like you need to do with the dog crate or cage. If you have enough gates, you can actually make a pretty large brooding area! If you happen to have a spare horse trough lying around, it will make an excellent brooder. 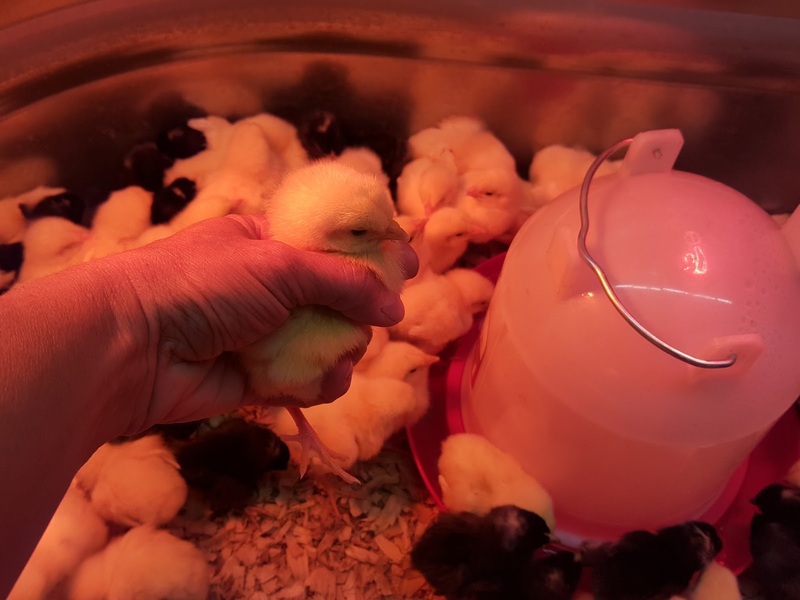 Metal or plastic, it's easy to clean, large enough for your chicks to really grow into it as they get older - unless of course you came home with 50 chicks! - and not likely to be a fire hazard. The sides won't be high enough to keep your chicks contained for long though, so you'll want a piece of screen for the top. Puppy playpens are one of my favorite things to use as a chick brooder. They're large enough that your chicks will have plenty of room as they grow, and they're super easy to hose off to clean. They're not too expensive - you can get a nice one from Amazon for around $40 - but if you already have one - even better! 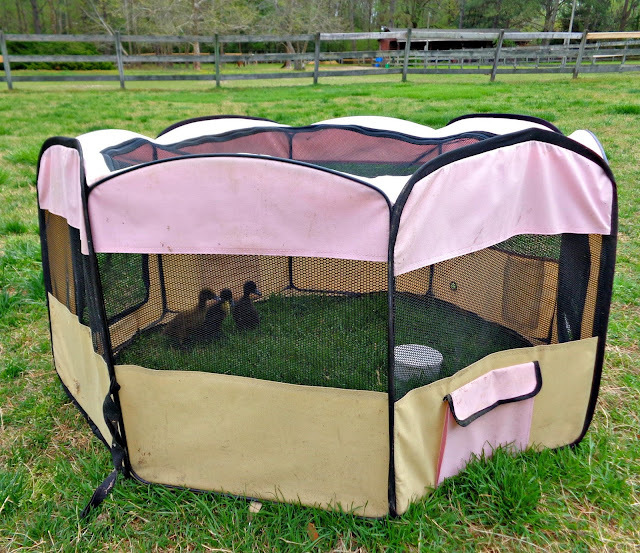 The playpen is already draft-proofed and since it has a top, it will keep your chicks confined inside. I love that the bottom comes out, so you can even move your chicks outside on nice days and let them explore a bit in the grass. It can be challenging to use a heat lamp with a puppy playpen unless you take the top off, but the Brinsea EcoGlow works great in a playpen. I especially like using a playpen for ducks, who make a big water mess and grow really fast. Bonus tip! If you're in a real pinch, put your chicks in a spare bathtub. Some rubber shelf liner or a grippy bathmat on the bottom so they don't slip and you're all set. A tub is a great brooder for ducklings especially since the water mess they make will just run right down the drain. And last but not least, if you totally go overboard with new baby chicks, you might need to set up an entire "brooder village" and use everything you've got on hand! You'll notice that Lauren is utilizing a plastic tote, dog crate, hamster cage AND galvanized wash tub. So take a look around your house and be creative! Other ideas that I've seen are to use a baby playpen or plastic kiddie pool. 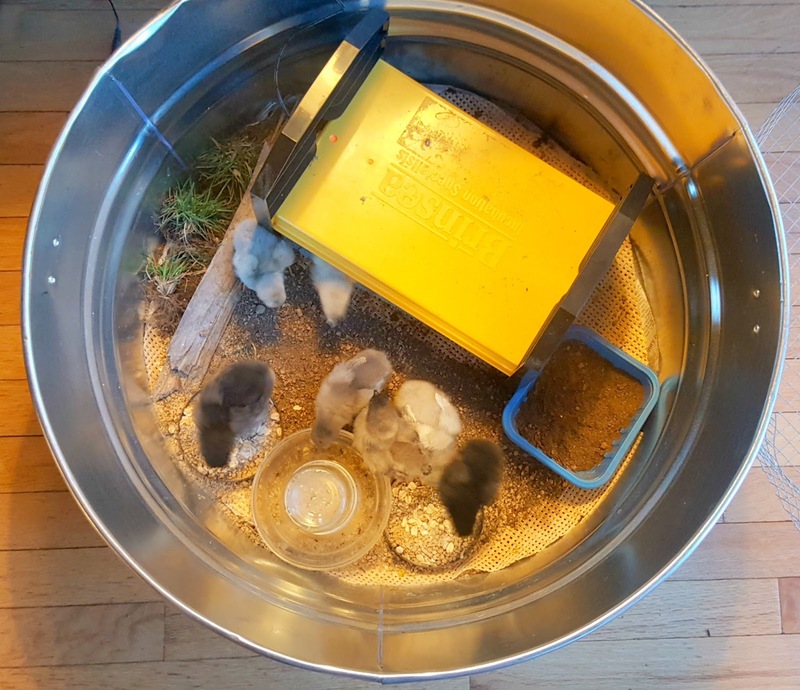 You can go out and buy a chick brooder kit, but I hope this has given you some ideas of what you can use to make a nice, safe chick brooder when you unexpectedly find yourself driving home from the feed store with a small box of peeping chicks on the seat next to you.